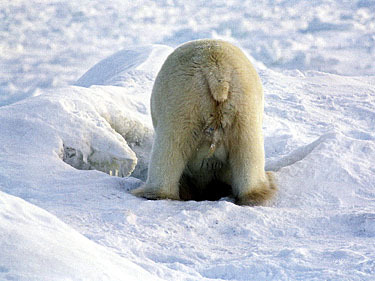 The polar bear (Ursus maritimus) is the largest species of all bears and is the largest terrestrial carnivore on earth. It is believed to have evolved between 250,000 and 100,000 years ago when a number of Siberian brown bears became separated by glaciers. As they moved farther and farther north, they adapted to the harsh environment of the Arctic. 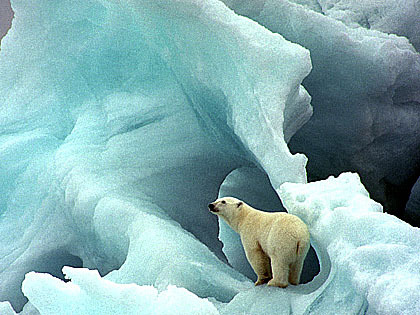 Polar bears are currently found in the Arctic regions of Alaska, Canada, Russia, Greenland, and Norway. Due to their bond with the ocean, they are considered to be marine mammals. In fact, Ursus maritimus (the polar bear's scientific name) means "sea bear." They are excellent swimmers and can swim up to 60 miles without rest. They have been seen on ice floes up to 200 miles offshore. They can also cruise at depths of 15 to 20 feet and stay submerged for over 2 minutes. Though they spend most of their time on ice floes or in the water, they have been sighted up to 100 miles inland. Unlike other bears, polar bears are nomadic and don't claim territories. They are known to travel great distances every year. However, they will often return to the same sites. For insulation, polar bears have an outer coat and a dense undercoat. It appears white, and may yellow from sun oxidation. The hairs of the bear's outer coat are transparent and hollow. Both their fur and skin are oily and very water repellant, so they can easily shake off water and quickly dry. They have a large layer of blubber up to 5" thick under their skin serving as additional insulation. When swimming, the polar bear's layer of blubber along with its hollow hairs adds to its buoyancy. Its huge forepaws (up to 12 inches in diameter) have partially webbed toes and are used as oars. The bottom of its paws are covered with dense pads of fur serving for both insulation and traction. The bear's ears and tail are small to emit as little heat as possible. The polar bear has excellent eyesight and hearing and has such a sensitive sense of smell that it can detect prey up to 20 miles away. Fully grown male polar bears range from 7' to 11' when standing upright, and weigh from 660 to 1,320 pounds. Females stand from 6' to 8' and weigh anywhere from 400 to 700 pounds. The largest polar bear on record was over 12' and weighed 2,210 pounds. Polar bears feed almost exclusively on meat. Ringed seals make up the majority of their diet, though they also feed on bearded seals, harbour seals, harp seals, hooded seals, and other sea mammals such as walruses and beluga whales. When food is plentiful, they will often just feed on blubber and leave the carcasses behind for scavengers. Blubber is better for maintaining their layer of fat for both insulation and storing energy. Some animals often rely on the remains of polar bear kills as a food source, making the polar bear an important part of the food chain. Having huge stomachs allows them to eat up to 150 pounds of food in a single sitting. Because of this, they can go up to a couple weeks without food if necessary. However, in order to maintain their body weight, polar bears must kill a seal (or equivalent) every 5 or 6 days. Being the most patient of all bears, a polar bear will sit for hours next to a hole in the ice waiting for a seal to surface. However, when pack ice melts in the summer, making it difficult to hunt seals, polar bears will hunt on land and feed on just about anything edible such as birds, rodents, eggs, berries, etc. Mating occurs every two or three years anywhere from late March to the middle of July. After the female's egg is fertilized, it freely floats inside her uterus and doesn't begin developing until September when the mother digs a den in the snow and stays there for nine months until her young are born. She usually gives birth to two cubs, though she may have anywhere from one to four. When the cubs are born, they are hairless and toothless and they are no bigger than a rat. The cubs usually stay with their mother for one to two years. Scientists estimate that there are 20,000 to 25,000 polar bears in the world. In the wild, polar bears are estimated to live to be 25-30 years old. Annual adult mortality is estimated to be 8-16%. In captivity, a 45 year old female was still alive at the Detroit Zoo in 1999. The polar bear was listed as threatened by the United States Department of the Interior on May 14, 2008, under the Endangered Species Act. Because of climate change caused by global warming, the ice pack upon which polar bears rely for survival is melting at an unprecedented rate. More and more bears have drowned as sea ice becomes more scarce. 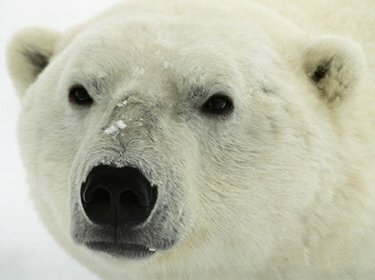 The polar bear could be driven to extinction by global warming within 100 years unless it is capable of adopting a behavior similar to that of the brown bear.